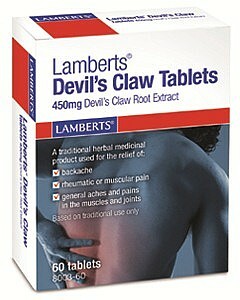 Lamberts Devil's Claw Tablets - traditional herbal medicinal product used for the relief of backache, rheumatic or muscular pain, and general aches and pains in the muscles and joints. Devils Claw Root Extract Traditionally used for the relief of backache, rheumatic or muscular pain Native to South Africa, Devil’s Claw gets its name from the tiny hook-like claws that cover its fruit. It has large tuberous roots which are the part used medicinally. It is used widely in France and Germany. Lamberts® Devil’s Claw is a traditional herbal medicinal product used for the relief of backache, rheumatic or muscular pain, and general aches and pains in the muscles and joints. This is based on traditional herbal remedies. Daily Intake: Take 1 tablet twice a day with water or other liquid. Do not exceed recommended daily dose.